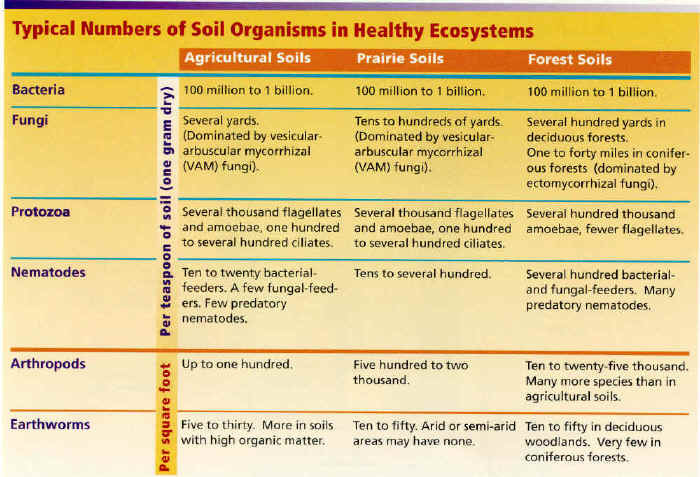 In chapter two of the Soil Biology Primer released on the web by the USDA, Dr Elaine Ingham reviews the interactions between the soil food web and soil health. Each field, forest, or pasture has a unique soil food web with a particular proportion of bacteria, fungi, and other groups, and a particular level of complexity within each group of organisms. 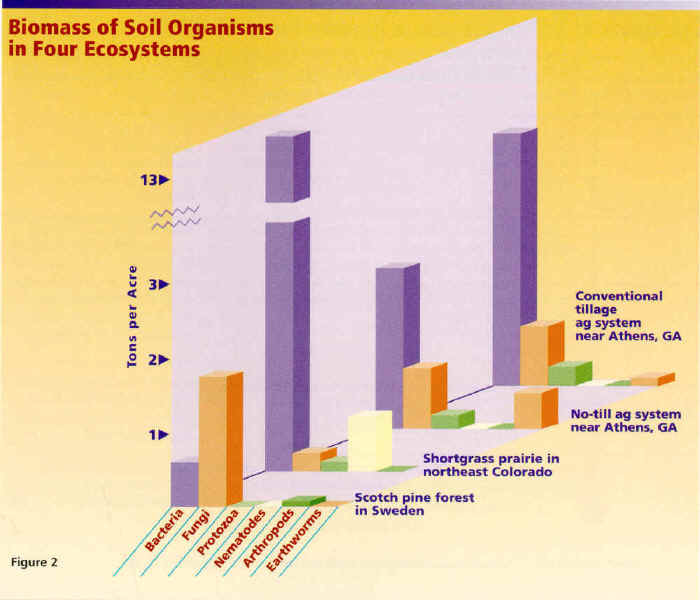 These differences are the result of soil, vegetation, and climate factors, as well as land management practices. * The ratio of fungi to bacteria is characteristic to the type of system. Grasslands and agricultural soils usually have bacterial-dominated food webs – that is, most biomass is in the form of bacteria. Highly productive agricultural soils tend to have ratios of fungal to bacterial biomass near 1:1 or somewhat less. Forests tend to have fungal-dominated food webs. 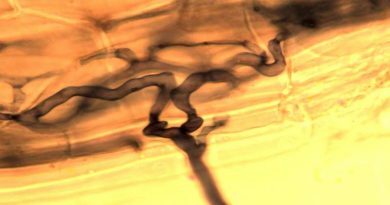 The ratio of fungal to bacterial biomass may be 5:1 to 10:1 in a deciduous forest and 100:1 to 1000:1 in a coniferous forest. * Organisms reflect their food source. For example, protozoa are abundant where bacteria are plentiful. Where bacteria dominate over fungi, nematodes that eat bacteria are more numerous than nematodes that eat fungi. * Management practices change food webs. 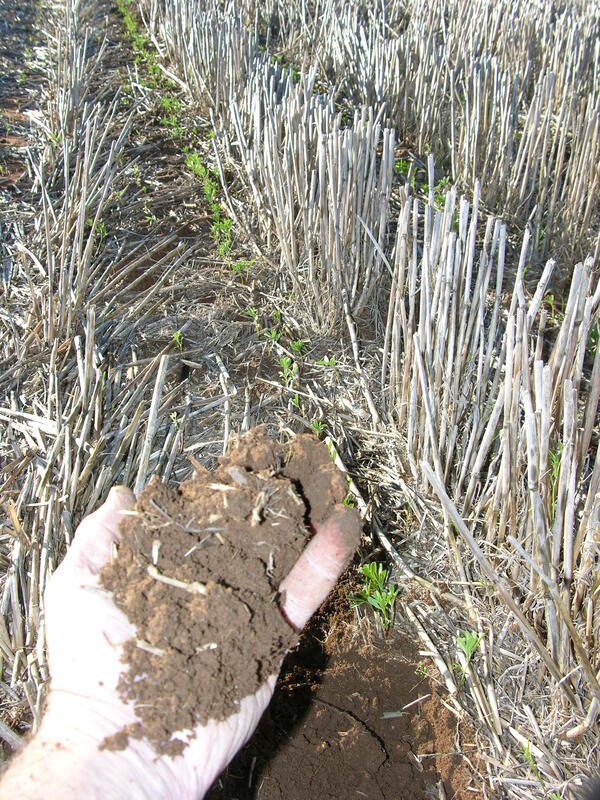 For example, in reduced tillage agricultural systems, the ratio of fungi to bacteria increases over time, and earthworms and arthropods become more plentiful. Direct counts – counting individual organisms with the naked eye or with a microscope. All organisms can be counted, or only the active ones that take up a fluorescent stain. Measuring activity levels. Activity is determined by measuring the amount of by-products, such as CO2, generated in the soil, or the disappearance of substances, such as plant residue or methane used by a large portion of the community or by specific groups of organisms. These measurements reflect the total “work” the community can do. Total biological activity is the sum of activities of all organisms, though only a portion are active at a particular time. Complexity can be determined, in part, from a food web diagram such as, which represents the soil in an old-growth Douglas fir forest. Each box of the food web diagram represents a functional group of organisms that perform similar roles in the soil system. Transfers of energy are represented by the arrows on the diagram and occur when one organism eats another. Complex ecosystems have more functional groups and more energy transfers than simple ecosystems. The number of functional groups that turn over energy before the energy leaves the soil system is different (and characteristic) for each ecosystem . In the Douglas fir system, energy may undergo more than twenty transfers from organism to organism, or between functional groups. In contrast, a cave or low-residue cultivated system is not likely to include a large variety of higher predators on the right-hand side of a soil food web diagram. Energy and nutrients will be cycled through fewer types of organisms. The functions of the food web are essential to plant growth and environmental quality. Good resource management will integrate food web-enhancing strategies into the regular activities of farms, ranches, forests, or in backyard gardens. Needed research will examine food web functions within whole systems, and will support technology development. 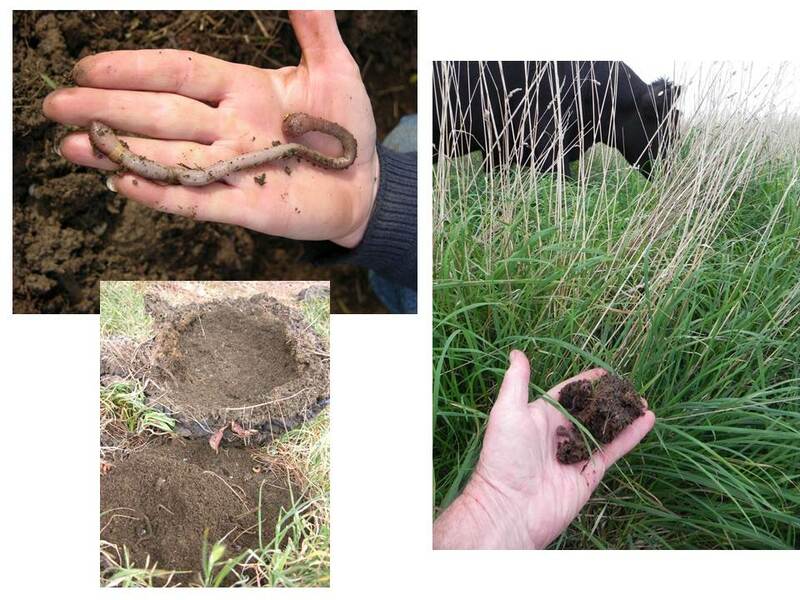 Technology to assess and maintain the functions of soil food webs will be developed to assist land managers and researchers as they strive towards soil productivity and stewardship. In the coming years, we can expect progress at answering soil biology questions such as the following.